FastCupid matches people online based on similar personalities, interests, and location. They not only provide people with matches, but allow people to search and enjoy lists and profile features. All this from right on your mobile phone! Contact and message FastCupid matches. Create a list of favorites. The mobile app on FastCupid is compatible with most mobile smart phones. No need to download an app, the mobile site is very mobile friendly and works well with the majority of smart phones. Simply type in the mobile address, and enjoy! Create a profile, complete your interests, and upload a photo to let potential matches know exactly who you are and what you're looking for. Premium Membership: starts at $34.99 for a 1 month membership. 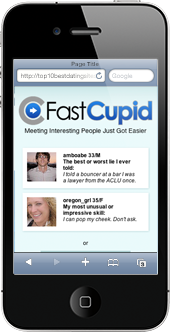 The mobile site for FastCupid is simple and easy to navigate. With a streamlined and intuitive design, the site looks friendly and clean right from your mobile phone. The mobile site provides a secure online experience to enjoy on a mobile platform. They will not share overly personal information such as phone number or e-mail address without user permission.